May 14: Portland, Oregon. INGENIO Milagro Play Reading Series. Reading of my play 1000 Miles. Click here for more details. Nov. 9: Miami Dade Library, Main Branch. Talk on Zora Neale Hurston, for unveiling of a first edition of Their Eyes Were Watching God. 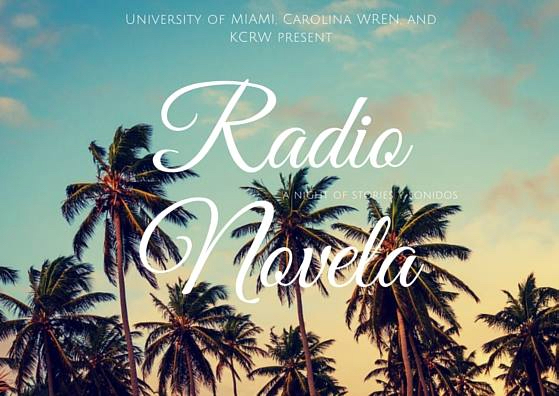 Part of Series: Stories from the Florida Vault.@12pm-2pm. Oct. 15: Theatre Lab, FAU. Teaching Master Class on Playwriting. Oct. 13: Theatre Lab, FAU. Reading of my play 1000 Miles @ 7:30pm. Click here for more details. 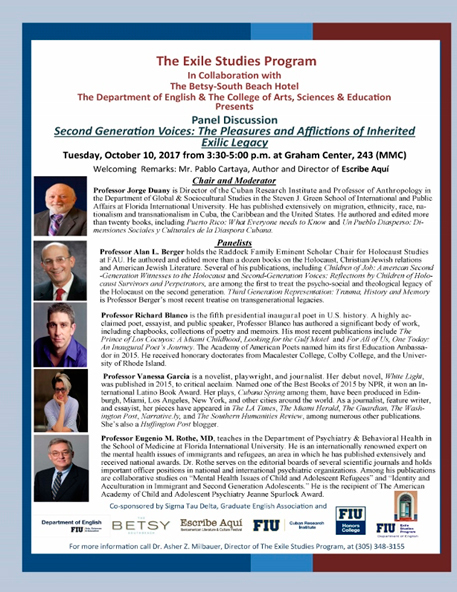 Oct. 10: FIU, Cuban Research Institute. On Panel called: The Pleasures and Afflictions of Inherited Exilic Legacy. Click here for more details. June 19: Miami, Fl. Gables Stage. Reading of my play, 1000 Miles. Click here for more details. April 1: Words of Resistance at Berkley Main Public Library. 4pm. Sponsored by Somos en Escrito. Click here for more details. February 24: 11th Conference on Cuban and Cuban American Studies. Cuban Research Institute @ Florida International University. Panel entitled: Beyond Los Atrevidos: Second Generation Cuban American Writers. @ 4pm. Click here for more details. June 23-28: ALA, Orlando. 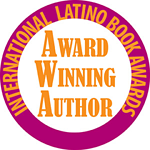 Attending as International Book Award Winner. 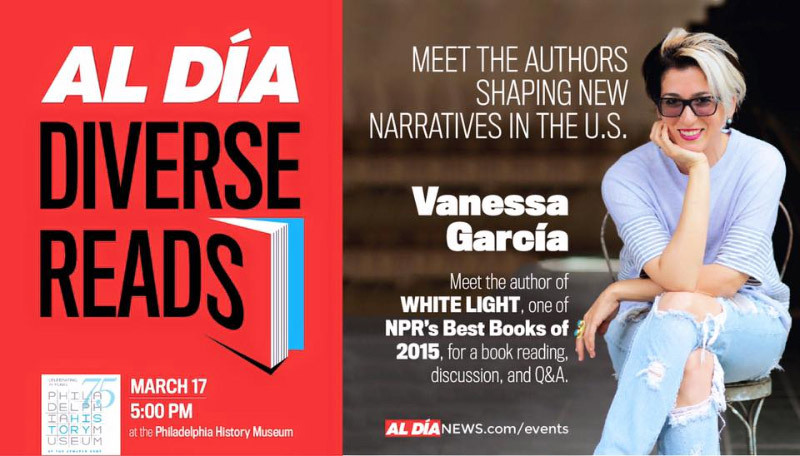 March 17: Diverse Reads:Meet the Authors Shaping New Narratives in the U.S., Philadelphia History Museum. Philadelphia, Pennsylvania. 5pm. 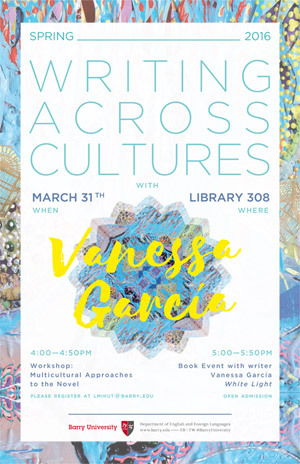 March 31: Writing Across Cultures: Multicultural Approaches to the Novel (a workshop & reading), Barry University. Miami, Fl. Library 308. 4-6pm. April 19: The Female Voice: What it Means and Why Readers Care. 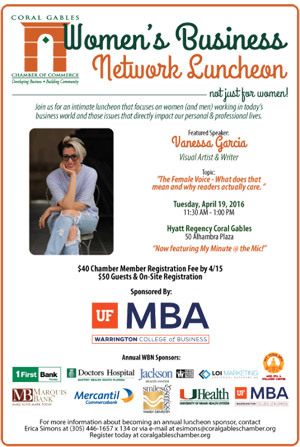 Coral Gables Chamber of Commerce, Women's Business Network Luncheon. Hyatt Regency Hotel, Coral Gables, Fl. 11:30am-1pm. Sept. 24: Launch and Reading of Novel, White Light, Books & Books, Coral Gables, Fl. 8pm. September 26: Reading of novel White Light, Skylight Books, Los Angeles, CA 5pm. PST. October 2: Reading of novel White Light, La Casa Azul Bookstore, New York, NY. 6pm EST.